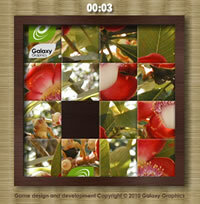 Flash Sliding Tile puzzle game. Reskinnable Flash game for license. Like Minesweeper, an offline version this game comes as standard with Windows, so it's amongst one of the most widely known games, especially when you take into account the number of real-life physical versions too. It's not a 5 second fire-and-forget game so your product and message within the jumbled up image will be in front of the user for quite some time if they want to get to the top of the score table - and they will be staring at it quite intently! A great promotional tool. This game is ideal for online marketing campaigns where a prize is offered for the best score on the leaderboard. The game and corresponding PHP also include anti-cheat code, making it much harder for the user to fake a top score. This game also features an internal scoreboard - no need to navigate away from the game to another page, it's all displayed within the Flash code via a PHP generated XML feed from the scores database. (You will need hosting capable of supporting databases and PHP or ASP server-side scripting to make use of this feature). Looking for Sliding Puzzle source code / Actionscript / .fla file ? The source code for this game is also available to buy from Galaxy Graphics. Click here to contact us about the Sliding tile game source code.